The Miami Music Project, which uses music as an instrument for social transformation, has launched a boot camp and is accepting applications to its summer camp to complement its four existing programs that most participants say helped their confidence, concentration and determination. Founded by conductor James Judd and established as a non-profit 501(c)(3) corporation in 2008, the Miami Music Project organizes children orchestras, a leaders orchestra for advanced students, a summer music camp and the Teaching Artists Training Program. The same year, it was awarded a $1 million grant by the John S. and James L. Knight Foundation’s Knight Arts Challenge. The children’s orchestra program is designed as an intensive, tuition-free, after-school music program providing hundreds of children from at-risk demographics with a fully integrated music curriculum. It is comprised of four chapters in Liberty City, Little Havana, Little Haiti and Doral. Five program levels are offered, depending on the child’s experience. “Depending on the level, we provide an average of five days of programming,” said communications director Melissa Taveras. The programming takes place after school during the academic school year, barring seasonal breaks. Currently, the children’s orchestra program is seeing an average of 500 students per year, with the leadership hoping to grow the program. “They are classically trained musicians who understand the program and understand the methodology and some offer one-on-one training with the students,” Ms. Taveras said. The organization also works closely with the New World Symphony. Symphony fellows sometimes teach guest classes for the students, with training for specific instruments. “We bridge these diverse communities through chapters and performances,” Ms. Taveras said. Students have the opportunity to perform at professional venues like the Adrienne Arsht Center for the Performing Arts and the New World Center. The recently launched bootcamp takes place during teacher planning days, when students are off from school. Miami Music Project orchestra boot camps, made possible by a Knight Arts Challenge grant, are free of charge intensive orchestra workshops led by Miami Music Project Teaching Artists along with distinguished special guests and classical music’s finest, according to the organization’s website. 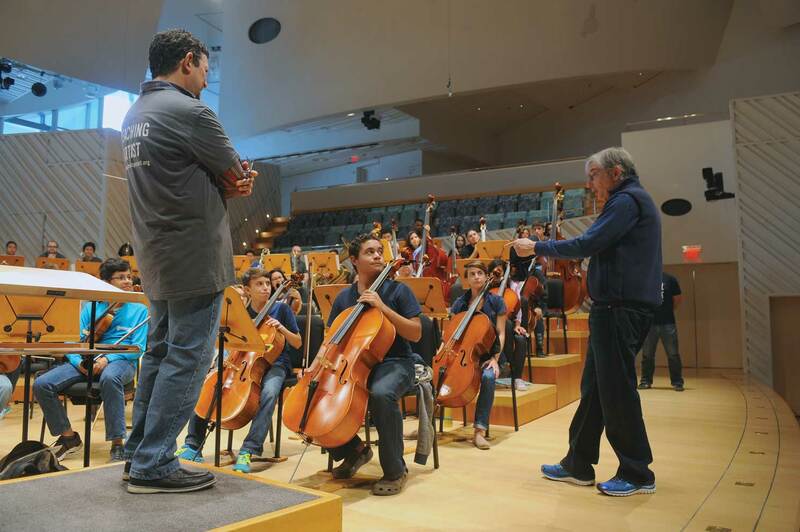 On Jan. 23, Michael Tilson Thomas, co-founder and artistic director of the New World Symphony, offered advice during the boot camp held at the New World Center in partnership with the New World Symphony. Miami Music Project’s Summer Music Camp is a four-week long program that aims to ensure that orchestral students continue to grow in their performance abilities through the summer months. Students participate in sectional and orchestra rehearsals, undergo daily repertoire analysis and participate in intensive social development activities, according to its website. The focus of the Summer Music Camp is to provide comprehensive music education through orchestral participation from very early stages, group lessons, and peer teaching. The Summer Music Camp is accepting applications now for the program that will run June 12 to July 7, from 9 a.m to 1 p.m. in Little Havana’s chapter at Citrus Grove Middle School. Results showed that nearly 94% of children in the program reported improved confidence, concentration and determination, 96% reported being more self-motivated, 93% reported being more creative, 92% reported improved self-esteem, and 93% reported better leadership skills. Parents of participants were also surveyed, with 68% reporting that they believed the program helped the child perform better in school, 68% that it gave the child expanded opportunities, and 56% that their own stress levels were reduced due to the child participating in an after-school program.